I can’t believe that Easter is just around the corner! 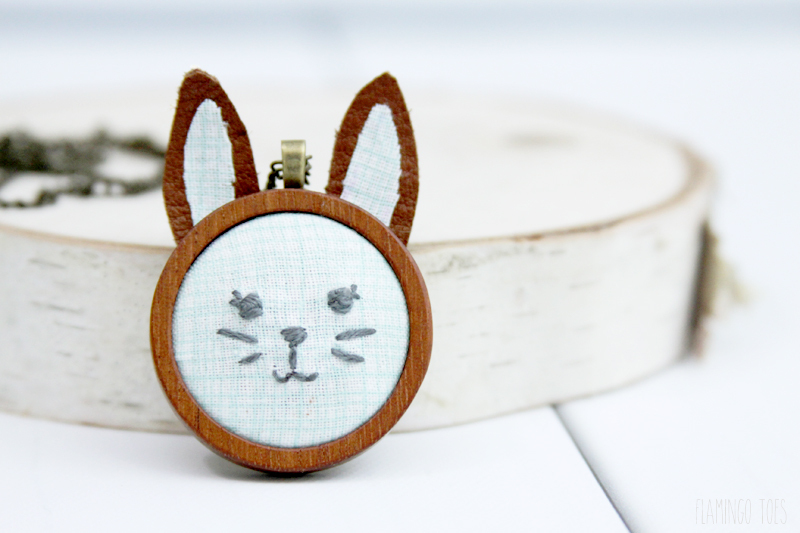 That means it’s time for all the Spring decor and accessories and I have such a fun new necklace for you today – this DIY Embroidered Bunny Pendant! Though I will confess – I love this little sweetie so much I would wear it anytime of year. Not just Spring! 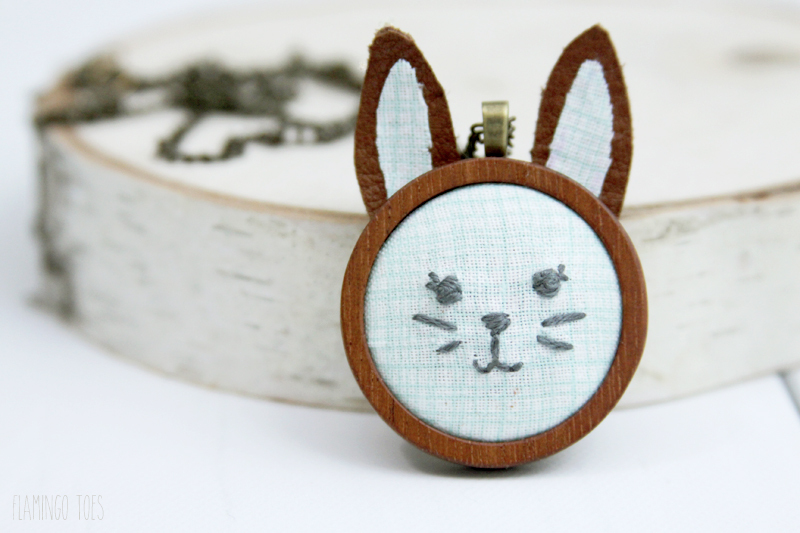 This cute little Bunny Pendant is so easy to make up. Just a little embroidery, some glue – and you are all set! 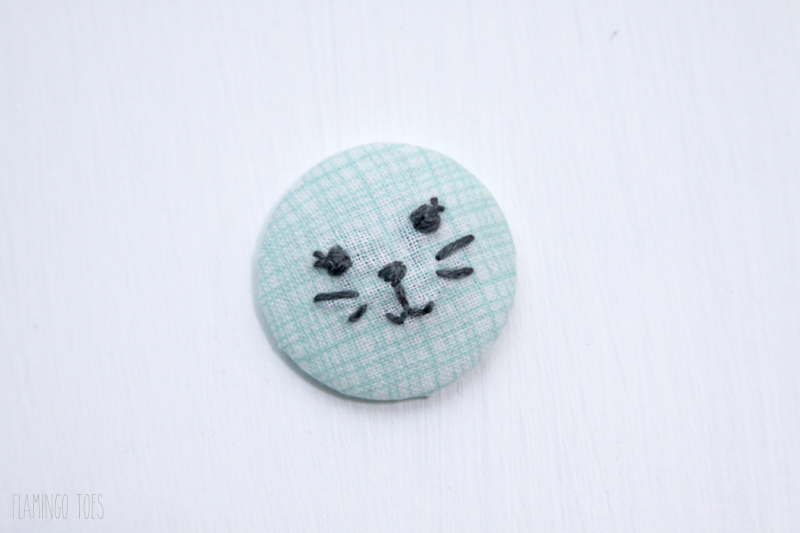 You could make things even easier and paint the face on – that would be super cute too! 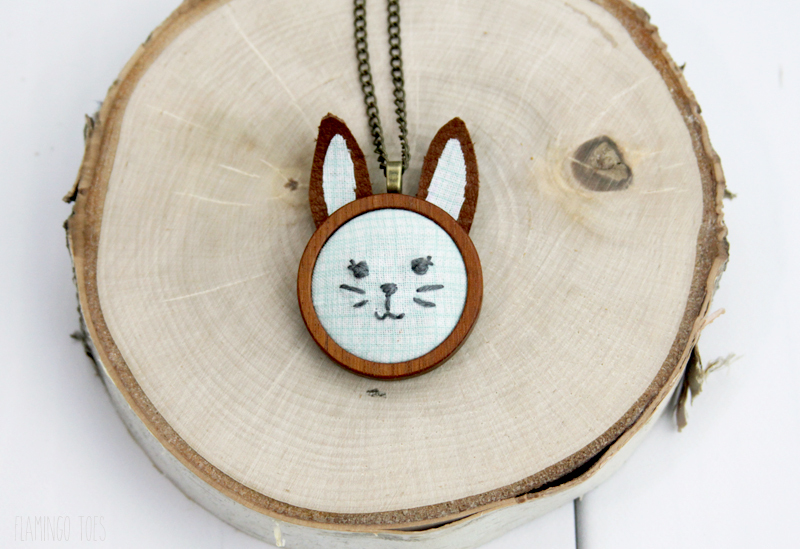 Our little bunny is all dressed up with leather ears to match the wooden pendant, and I love how the turquoise fabric looks with the leather. If you wanted a white bunny, that would be easy too – you could just paint the wood frame and use white leather. That would be super cute! 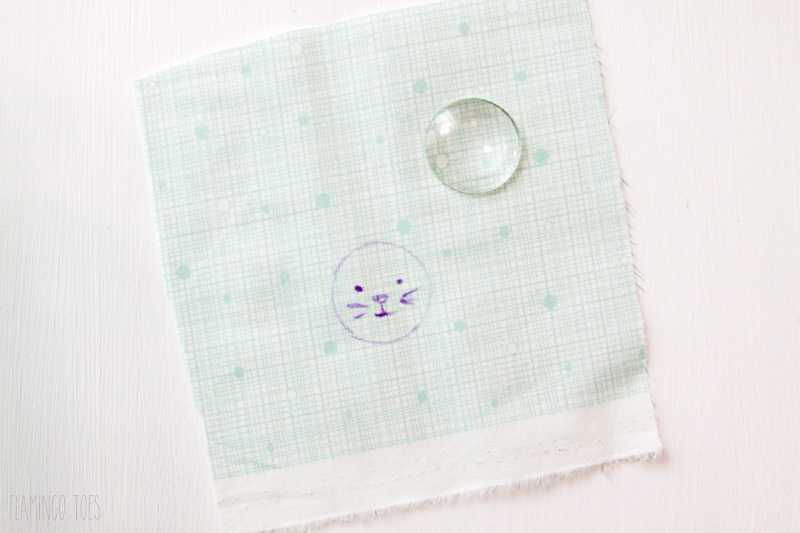 Trace your glass cabochon onto your fabric with your disappearing marking pen. 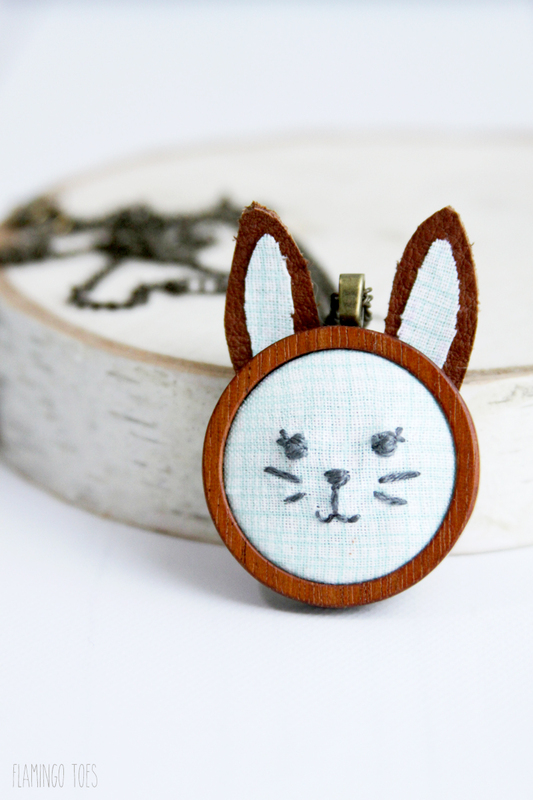 Draw a little rabbit face onto your fabric. 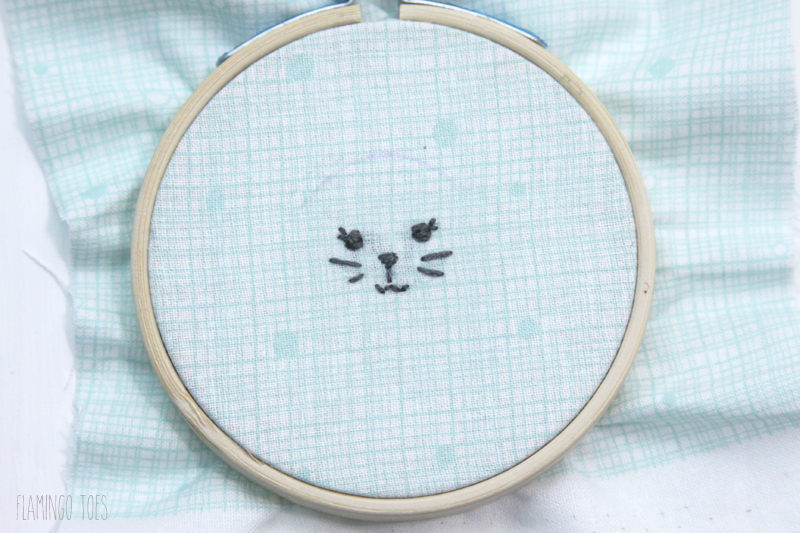 Using 3 strands of floss, embroider the face on the fabric. Try to keep the thread as light as possible on the back – don’t use thick knots. Everything on the back will make the fabric stand up off the glass cabochon. 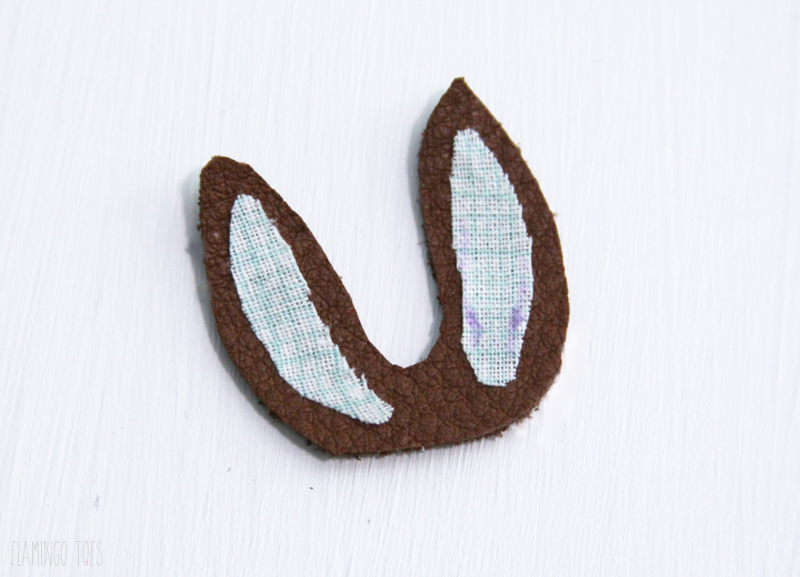 Trim around your bunny face, leaving about 1/2″ around the traced circle. (That you can’t actually see here. Pretend it’s still there k?) Glue the fabric to the cabochon. I used a spray adhesive and that worked great, but you can also Mod Podge the fabric in place. Just wrap the ends around to the back of the glass (the flat side) and keep rubbing the creases out along the edges with your finger. 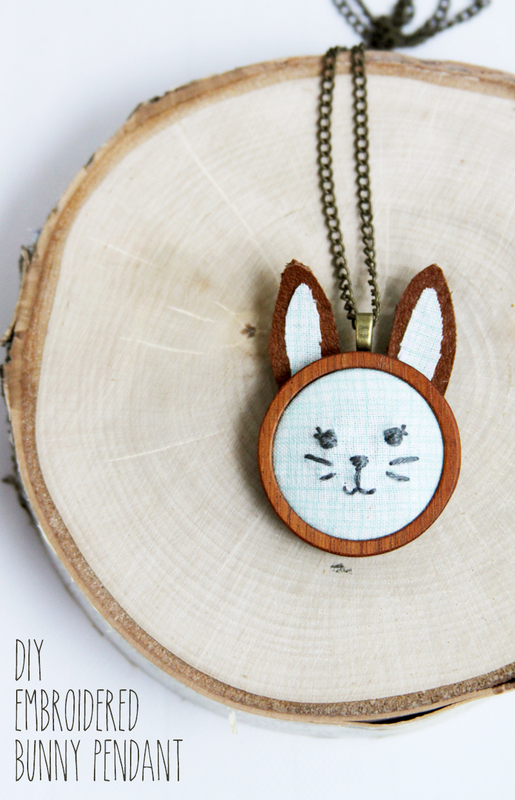 Glue your cabochon in place in the wood pendant, making sure that the face is vertical. 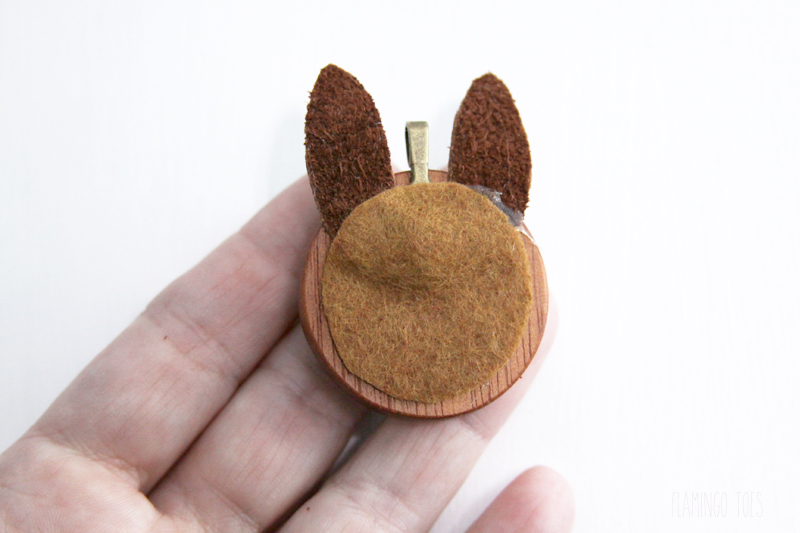 Draw out some little ears for your bunny. Trace the design onto the leather scrap and cut out. 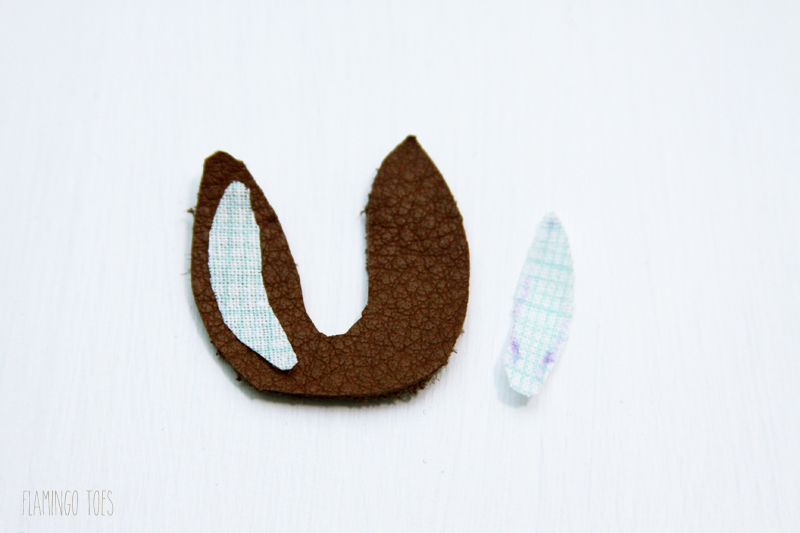 Cut out two smaller pieces of your fabric for the ear centers. This took me a few tries – they are so small. But you just want the shape to kind of mimic the leather shape, but smaller. Glue the fabric in place on the leather. It doesn’t matter that the fabric doesn’t connect in the center – that part won’t show. Place the ears on the back side of the pendant. Glue the center area in place to the back of the wooden pendant. Cut a circle out of felt, just smaller than the wooden frame. Glue this in place on the back of the pendant. This will help hold the ears in place and cover up the base so it looks nice and pretty. Add a necklace chain through the bail on the pendant. I used a thin chain so it wouldn’t bump the ears. Add a lobster clasp and jump ring to each end of the chain – or you can buy a necklace chain with the closure already attached. Super easy. And that’s it! So cute right?? 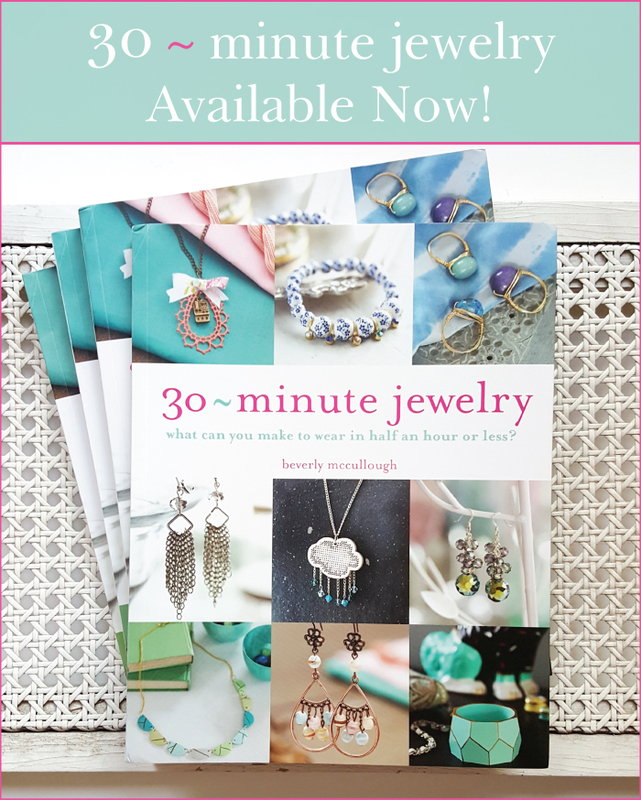 I have a similar project in my book, 30 Minute Jewelry, but it’s a cat necklace! So if you pick up a copy of the book check that out. Here are a few other necklaces you might like too! So sweet, and have been wanting to do one of those cross stitch ones, all amazing little findings from Etsy that I keep meaning to order but truthfully need to use up all the stuff I have first! Thanks for sharing on craft schooling sunday! That is so ridiculously adorable! I bet it would be cute on a backpack! My daughter and her friends love hanging cute little things from their zippers, and that would be one of the cutest for sure! Cute, and I learned something new! I didn’t know about dissapearing pen! Thanks for sharing this with us on Throwback Thursday! Hope to see you next week! 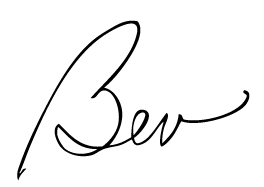 Just adorable, Bev, and really wishing I had time to make one for my daughter and all her friends. Thanks for linking up at #SaucySaturdays.